Predatory bacteria - that eat others of their kind - could be a new weapon in the fight against superbugs, say UK researchers. Experiments showed a dose of Bdellovibrio bacteriovorus acted like a "living antibiotic" to help clear an otherwise lethal infection. The animal studies, published in Current Biology, suggested there would be no side effects. Experts said the approach was unusual, but should not be overlooked. Fear of an antibiotic apocalypse, caused by growing levels of bacteria resisting the drugs, has led to scientists trying other approaches. Bdellovibrio is a fast-swimming bacterium that works its way inside other bacteria where it devours its hosts' insides and swells in size. Once it has finished feeding it replicates and bursts out of its now dead host. 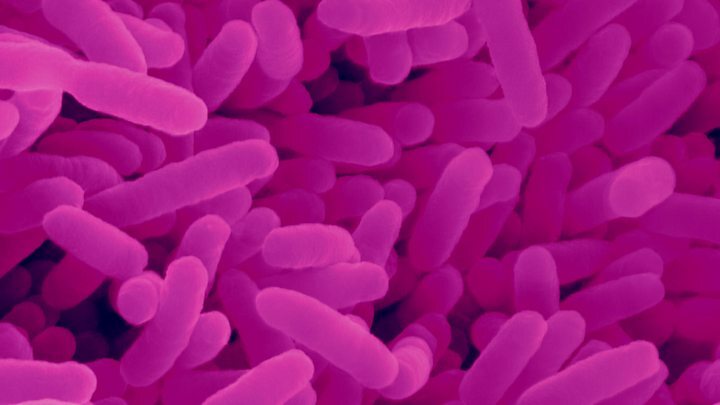 The team at Imperial College London and the University of Nottingham tried using Bdellovibrio bacteriovorus to kill a common cause of food poisoning. Shigella bacteria make 160 million people ill each year, and more than a million die, largely through contaminated food. Tests in a laboratory dish showed the predatory bacteria caused the population of superbug Shigella to collapse 4,000-fold. Further tests in fish larvae showed a deadly dose of the superbug led to only 25% surviving for three days. But when the fish larvae were also "infected" with the predator, survival soared to 60%. Dr Serge Mostowy, from Imperial College London, told the BBC: "It is definitely a creative approach and what is special is the inability of the host to develop resistance." He added: "It's an important milestone in research into the use of a living antibiotic that could be used in animals and humans." However, the researchers believe Bdellovibrio could be more useful in treating infected wounds, rather than those that have spread through the body, as the predatory bacteria can be easily injected into the site. 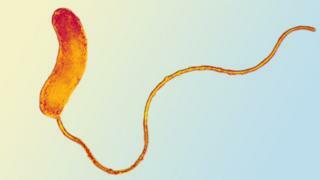 Far more safety testing is needed before using Bdellovibrio therapeutically could be attempted. The researchers noticed the predatory bacterium worked best in conjunction with the fish's immune system. Prof Liz Sockett, from the University of Nottingham, said: "It seems that the Shigella pathogens are evading the immune system, but when Bdellovibrio is there it is releasing broken parts of Shigella and that is giving extra signals to the fish that it should be dealt with." Bdellovibrio has been shown to kill a range of bacteria including E. coli and Salmonella. The researchers said there were no signs of side effects and that the fish could tolerate very high levels of Bdellovibrio. The predatory bacteria have been found naturally living in our bodies by other researchers. Dr Michael Chew, from the Wellcome Trust medical research body, said: "It may be unusual to use a bacterium to get rid of another, but in the light of the looming threat from drug-resistant infections the potential of beneficial bacteria-animal interactions should not be overlooked. "We are increasingly relying on last-line antibiotics, and this innovative study demonstrates how predatory bacteria could be an important additional tool to drugs in the fight against resistance."